We experience life through light, colour and sound. Colour, sound and aromatherapy are also forms of vibrational healing that are able to penetrate the subtle bodies and harmonise the mind, body and spirit. Intuitive colour reading is a gentle therapeutic tool to help you understand yourself on a deeper level exactly as you are in the moment that the reading takes place. It has links with aura readings, but with this method, your subconscious speaks to you through symbolism and the colours you are drawn to at the time. It relates to the spiritual psychology of colour and can help you to understand how to proceed at those times of indecision or soul searching. Using the vibration of colour awakens our intuition and uplifts conscious awareness so that we have more clarity with our direction. Jan created a unique method of assessing the energy patterns of her clients through inspiration and knowledge acquired during training and mentoring with Lilla Bek, Vicky Wall and Marie Louse Lacy in the late 80’s. Lilla Bek acclaimed lecturer, author and counsellor developed a profound understanding of health and the nature of disease through skills gained in the scientific-medical fields and as a Therapeutic Yoga teacher. The practise of yoga heightened her awareness to such an extent that she could feel the quality and colour of the aura. Vicky Wall was an author, pioneer and founder of the Aura-Soma (R) Colour Care System in 1983 and could see auric magnetic energy fields due to her gift of second sight. She learnt to recognise the colour signatures of plants and how they could be used for healing and later trained as an apothecary. Marie-Louise Lacy was a pioneer of colour therapy, International lecturer and author of “Know yourself Through Colour”. Each of these teachers knew the value of colour in understanding our physical, emotional, mental and spiritual natures. Jan also attended many hours of study during retreats in Spiritual Psychotherapy with Peter Goldman and Dr. Helene Harris at the Centre of New Directions in Kent and continues to be inspired by their work with vibrational healing. The therapeutic use of colour dates back thousands of years to the healing colour and light temples of Ancient Egypt and the civilisations of Ancient Greece, China and Tibet. The Hopi Indians of North America also had an inner knowing of the subtle energies that are invisible to most people today, with the exception of sensitives such as those mentioned above. The physical body is our most obvious experience of who we are, but we also have an emotional, mental and spiritual body and certain illnesses are said to originate as dis-ease on at least one of these levels. Each of these “subtle bodies” has a particular vibration and frequency that can be disturbed due do negative thoughts, emotions or external discordant vibrations. Illness can therefore be affected by the psycho-somatic (mind-body) and psycho-spiritual realms. 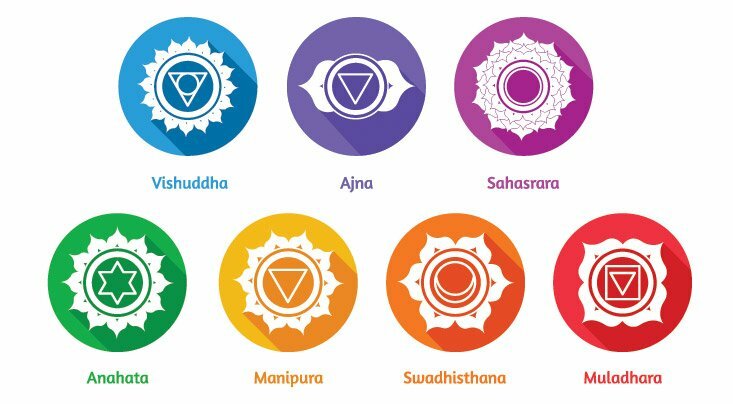 The emotions, thoughts and physical body are thought to interact and affect each other through vortexes of energy, known as chakras, Meaning “wheel” in Sanskrit, these vibrational, spinning wheel-like structures are located at various points along the spine from the tailbone to the crown of the head. Others extend even beyond the physical. Each of the seven main centres is said to link with one of the glands of the endocrine system and carry a particular colour vibration. The base chakra is situated at the tailbone and is connected with our sense of survival and belonging on this earth. When out of balance, we can feel ungrounded and spaced out. It is associated with red energy so Introducing that vibration into our environment or to the skin in the form of flowers, coloured lights, clothing or essential oils can help. Yoga, Tai Chi and other forms of exercise, especially walking, being in nature are excellent too to help us reconnect. 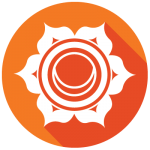 The sacral chakra or ‘hara’ is located just below the navel and relates to creativity and relationship, whether creativity in the artistic sense or in that of creating new life and our relationship with ourselves as well as others. It is also known as the “dwelling place”. Introducing the colour orange into our lives through our surroundings, clothing, essential oils or music that vibrates on this wavelength will encourage creative energy to flow and renew vitality. 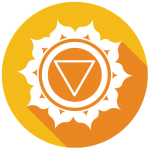 The third chakra sits just above the naval at the solar plexus – which innervates most of the digestive system. This rich nerve plexus can be experienced as “butterflies” when we feel excitement or anxiety. It is linked to the adrenals, the expression of our personal power, confidence, self-esteem and higher wisdom. 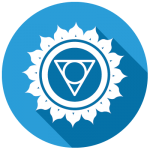 This chakra is said to resonate with various shades of yellow and is known as Manipura in Sanskrit or the city of jewels. 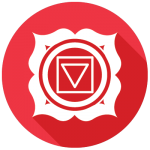 The heart chakra is connected with the thyroid gland and is the link between the lower and upper chakras. Our sense of self worth and empowerment lies here and unconditional love for ourselves and others. When in balance, there is kindness and compassion, when out of balance there are more negative thoughts, feelings of inadequacy and a tendency to be selfish. 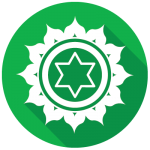 It resonates with apple green and is known as Anahata in Sanskrit. The throat centre vibrates to blue on the colour spectrum and connects the heart and brow centres, expressing our inner truth, creativity and communication. When out of balance these qualities may feel blocked and there can be a loss of interest after a period of enthusiasm. The thyroid gland is associated with expression and may be also be affected. 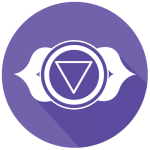 The Ajna centre or brow chakra is also known as the “third eye” as it is associated with intuition, insight and wisdom. It is thought to be indigo in colour and in health allows the qualities of clear purpose, dedication, self-motivation and focus. When out of balance there can be confusion and a tendency to dwell on details. It links with the pineal gland. 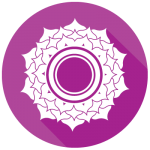 The crown chakra is located at the top of the head and is depicted as the thousand petaled lotus, Sahasara, being very symbolic in yoga and meditation practises. It links with violet, the pituitary and practical spirituality. There is a conscious connection to a greater plan, confidence and maturity when this centre is open, but feelings of loneliness and isolation can occur when this chakra is closed to our connection with spirit. Jan is a BSY Registered Holistic Fertility Therapy Practitioner. Qualifying with eight straight distinctions demonstrating her passion and desire to help couples who are struggling to conceive. Jan began teaching Dru yoga in 2009 and spent a year in post graduate training in yoga therapy for back care. Her ongoing studies in nutritional healing have been inspired by her understanding and practise of Ayurveda. I found my recent session with Jan extremely helpful. Her kind and gentle manner, and her willingness to combine colour therapy with yoga exercises and massage was just the kind of holistic approach I was looking for. We would love to hear from you, why not connect with us and keep up to date with Essense Holistic.